Couturier Lafargue, Camping in the asbestos mine, 2013. 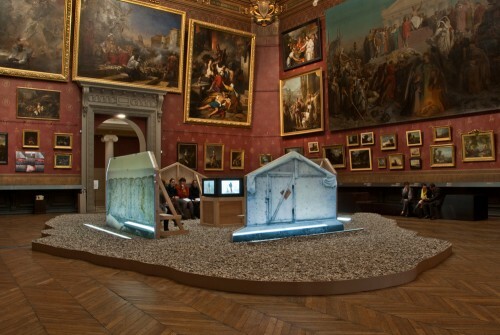 In 2013, Canadian artists Louis Couturier and Jacky George Lafargue, who make up the collaborative duo known as Couturier Lafargue, spent four days and three nights in an open pit mine in Asbestos, a town located in southeastern Quebec whose name derives from the eponymous mineral it was famed for producing. The Jeffrey mine, which had once been the world’s leading producer of asbestos, had ceased operations in 2011. During their visit to the mine, the artists hiked their way around the enormous space, researched its composite materials, and took video, photographic, and audio footage that would eventually form the basis for installations inspired by the landscape of the mine that include sculpture, video, and large-format photographs. These modular installations, which the duo titled Asbestos Country (Terre d’amiante), offer a sobering investigation into the impacts of industrialization on the Québécois landscape and its surrounding community, and open up questions relating to the ways we engage with otherwise forgotten or overlooked locations. 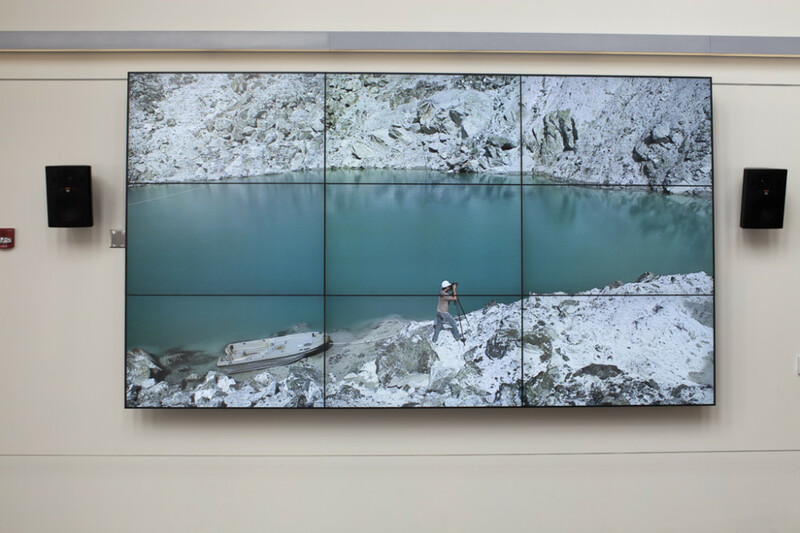 Couturier Lafargue presented an iteration of this project in the newly-completed Ronald Rettner Hall for Media Arts and Innovation building on the University of Rochester’s campus in February 2014 as part of a one-week artist residency. The program, which marked the inauguration of a new initiative that will bring artists to the University of Rochester’s campus every semester, was comprised of studio visits with undergraduate art students, an installation derived from Asbestos County, a public lecture, and the production of a series of large format inkjet prints. Asbestos storm, video. Duration 5 minutes. University of Rochester (USA), 2014. The duo presented a series of still and moving images in the lobby of Rettner Hall that documented the mine’s material and the atmosphere of its landscape. 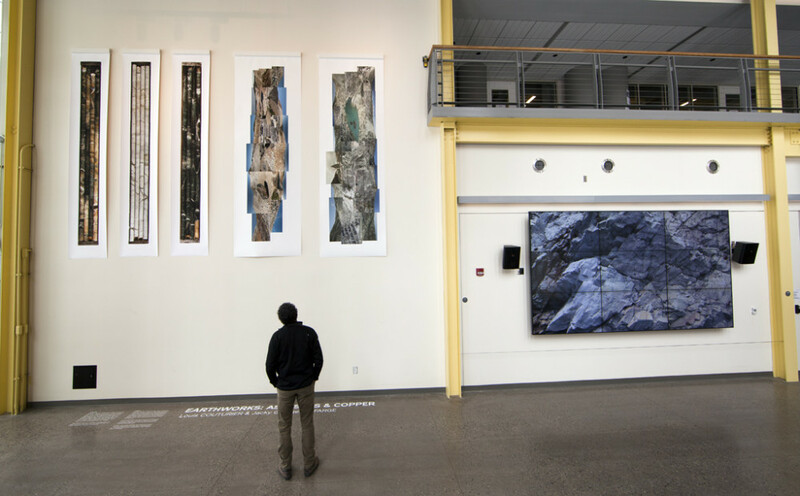 The exhibition, titled Earthworks: Asbestos and Copper, featured large-format photographs and video that depicted the landscapes of the Jeffrey mine in a variety of scales and viewpoints. 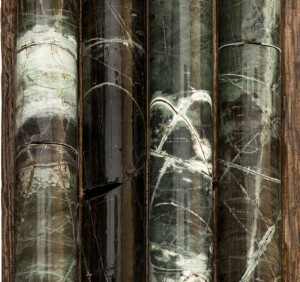 Close-up images of stone coring samples gathered at the site were juxtaposed with composite panoramic images of the immense valley and lake created by the excavation. These horizontal landscape images were hung vertically to parallel the shape of the long coring samples beside them, thereby creating a sense of disorientation that gently thwarted any attempts to gain a complete or hegemonic perspective of the site. The video work that appeared alongside the photographs offered a third viewpoint that functioned in human scale. Here, the camera traced the rocky walls of the mine from a boat on the lake that forms the center of the site, and cuts to shots that gaze down toward the lake from points along the walls. It was here that we could also observe Lafargue, who appeared as a single figure working with his photography tripod and boat amidst the vastness of the landscape. We began to gain a more comprehensive sense of the site’s scale as well as an understanding of its silence and stillness. The beauty of destruction, 2013. Installation, Musée Acadien du Québec, Bonaventure. L’abri, Musée de Picardie, Amiens, 2011. Earthworks: Asbestos and Copper. Exhibition at University of Rochester (USA), 2014. Louis Couturier and Jacky George Lafargue have worked collaboratively since 1991. Formerly titled Attitude d’artistes, the duo adopted the name Couturier Lafargue in 2008 and have created work in a variety of media. 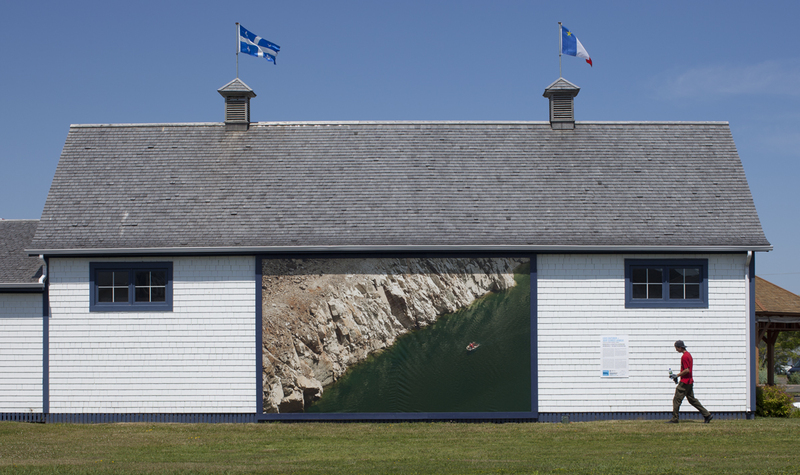 Recent works include photography installed on the façades of public buildings in Gaspésie, sculpture presented in a fine arts museum in Amiens, and video screened for the community of Resolute Bay. By engaging with the traces left upon landscapes by human activity, the artists create an archive that documents the history of each site in question while simultaneously displacing the location of its consideration into built surroundings. Earthworks: Asbestos and Copper creates discourse around an environmental site that the artists found as a fully-formed mine created by human industrial activity. The mine’s status as a found object that Couturier and Lafargue animate through research and documentation allows it to function as a post-industrial counterpart to the land and environmental artworks made in the late 1960s and 1970s by Robert Smithson, Robert Morris, Helen Meyer Harrison and Newton Harrison, among others. To the extent that their project creates discourse around an environmental site that was created by past activity, Couturier Lafargue’s work operates as a performative investigation into found earthworks. Through the presentation of disparate images in a variety of media, this work evokes the specificity of a distant landscape whose image is self-consciously incomplete. By encouraging us to confront our inability to grasp the scale of the landscape and the complete history of its story, it reminds us of the human ability to truly shape the natural world, and the persistence of our endeavors to know how, and why. Core Samples, photographic print on canvas (detail), 2014.